CLEVELAND — The quiet clothing room at the May Dugan Center doesn't do justice to how busy Laverne McNamara is keeping the room organized while caring for two sick roommates. "I work a lot of hours for other poeple, and rarely do I take much time for myself," said McNamara. She gets $90 every month from the Supplemental Nutrition Assistance Program, commonly called SNAP, or "food stamps." More than 1.5 million Ohioans get them, and McNamara said it makes ends meet for her, but barely. "If I could take someone to the store and show them how I stretch that..." McNamara said as her voice trailed off. For much of 2018, people like McNamara feared the new Farm Bill, which funds SNAP, would increase work requirements to get the benefits. SNAP already makes anyone who is 18 to 49 and not raising small children work at least 20 hours a week for their benefits. The proposed changes would have increased that age to 59, which would have included Lavine. It also makes a big impact on people like David Johnson. "Worrying day-to-day, you don't know if you're going to be eligible to receive the help that you need to take care of your family," said Johnson. He said he relies on local food pantries to stretch the money he gets from SNAP and still barely gets his household through the month. "It's vitally important," said Johnson, referring to SNAP. "Without it, I don't know how we'd get through." After debates over new work requirements played out for much of 2018, the Farm Bill Congress is sending to President Trump's desk doesn't change work requirements at all. That means anyone who is 18 to 49 and not raising small children still have to work at least 20 hours a week for their benefits. "We're really pleased by the new Farm Bill," said Greater Cleveland Food Bank CEO Kristin Warzocha. 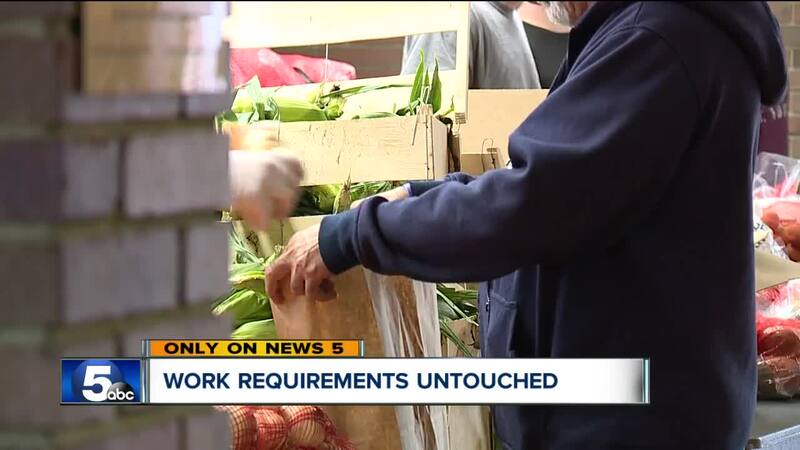 Warzocha said removing the additional requirements is important because SNAP feeds so many more poeple than even the Greater Cleveland Food Bank's huge warehouse can keep up with. "For every one meal that a food bank makes possible, 12 meals are provided to families by the Farm Bill," said Warzocha. Just as the federal government was passing the Farm Bill, Ohio's State House was chiming in too. A bill heading to the Governor's desk could make the state make sure SNAP recipients are eligible for their benefits four times a year, instead of just once a year.